Suicide is the single biggest killer of men aged 20-45 in the UK. Depression and undiagnosed mental illness are huge contributors to these deaths as they’re often more difficult to diagnose in men. And those men don’t tend to talk about the typical symptoms or visit their doctor. For nearly a decade he kept his depression secret, it made him feel so weak and shameful he thought it would destroy his whole life if anyone found out. And Tim is not alone. After finally opening up he realised that mental illness was affecting many men around the globe – and he knew that wasn’t ok.
A brutally honest, wickedly warming and heart-breaking tale about what it really takes to be a ‘real man’, written by one who decided that he wanted to change the world by no longer being silent. This is Tim’s story, but it could be yours too. First off: I love the title. It pretty much sums up the entire book and my thoughts on why men struggle so much more with the stigma of mental illness. Boys don’t cry. Boys don’t don’t say they’re struggling. Boys kill themselves. This is a tough book to review, as memoirs always are but especially so because this is about such a tricky subject matter. If you don’t 100% enjoy/approve of a memoir, you feel like you’re casting judgement on the author’s life which is something that I just can’t do. The purpose of this book means so much to me, it’s about reaching out to younger men and telling them that it’s time to speak out about depression. Rather than keeping it to themselves and hating themselves for the feelings they’re having, talk to someone: a doctor, a stranger, a loved one, your dog…. Anyone! Say it out loud and you’re getting somewhere. Depression is only made worse by not understanding it and by being ashamed of it. You wouldn’t be ashamed of a broken leg so don’t be ashamed of this. 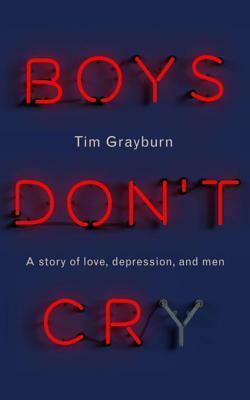 The first three quarters of this book is Grayburn explaining how depression affected him – from before his diagnosis, to his problems with medication and finally being ‘outed’ when his girlfriend found his pills in his bag. This part is so necessary – a regular bloke talking about his regular life and how he felt knowing that depression was controlling his life, but not knowing that he could discuss it with people. The last part of the book got a bit more philosophical and had ideas that I didn’t totally agree with, or rather, had elements missing. I personally believe that the author puts too much emphasis on communication and therapy as the cure for depression, I’m in the camp that sometimes depression really is just an imbalance of chemicals in the brain which leads to the mood problems and unwanted thoughts, which would explain the hereditary element (I’m biased on this point, I come from a family that struggles with depression – we all have different life experiences but most of us end up in the same dark place). On that train of thought, I also think that current anti-depressant medications need some serious upgrading – with all the side-effects, they’re pretty much a blunt instrument for the most important organ we have. Baaaaack to the book though, the writing style has a debut novel feel to it which I think is perfect in this case. The rawness of the writing is what makes you feel like you’re sat in the pub with a mate who’s telling you the story of his life and how he finally reached a happy point in his life. ‘Brutally honest’ is something I think we’ll be hearing a lot of when it comes to this book, Grayburn bears his soul – warts an’ all. He fesses up to things like being a bit put out that his wife wasn’t as enthused about their first tour once she found out she was pregnant- society demands that we immediately bring our hands to our faces and say ‘surely not!’ then you realise that you’d absolutely feel the same way if it was you. Nobody is that bloody selfless and the way you feel about things doesn’t change the second you find out you’re going to become a parent. This book is probably the most important one I’ll read this year, I can’t recommend it enough for those lads out there who are pretending that they’re not struggling with depression or any kind of mental illness. You might be able to connect with this book in a way that you can’t with people you know, so please give it a go. If you’re like me and you’re terrified that the doctor is going to tell you to man up, not believe you or just throw drugs at you and kick you out of the door: it’s not like that at all. It took me [an undisclosed and appalling number of] years to grab my lady balls in both hands and go to see my GP about my own depression, her response took my breath away. She was sympathetic, kind and listened to me when I said I wanted to try alternative therapies before anti-depressants. She didn’t push me to do anything or get all touchy feely, she was just… brilliant. The best thing she did was make sure that I didn’t just disappear after our appointment, she kept checking up on me so I couldn’t hide under my bed for the rest of my life. If your doctor does anything less: they’re crap and you should find a new one! The problem is with them, not you. If you’re ready to talk to someone but don’t know exactly how to have the conversation: call these guys. They’ll talk you through what to expect with your doctor, work etc and make sure you don’t get shafted – I can’t recommend them enough.